Find a system image software is helpful to you for creating system image. You can use the the system image to restore your computer to an earlier date when you need. System image is an exactly copy of your hard drive in a certain way. It contains the system applications, system settings, and other files on your computer. It is useful for computer users. As a computer user, you may meet many situations like system crashed, hard drive broken, etc. Those bad situations caused your data loss, which could be a damage to you. But if you created system image before, you can use it to restore your computer to an earlier date, so that you can minimize the damage. So, yes, the biggest use of system image is for deployment. Windows 7/8/10 are all built in backup and restore tool for imaging system and restore from it. You can create system image with this built-in backup tool, like Backup and Restore in Windows 7, File History in Windows 8. However, many users met some error while using the built-in tool, like Windows 7 x64 system image restore fails with 0x80042412. To avoid the similar problems, the best way is to find a free system image software to replace Windows built-in tool. A free system image software should be able to create system image and restore from it with simple operations. 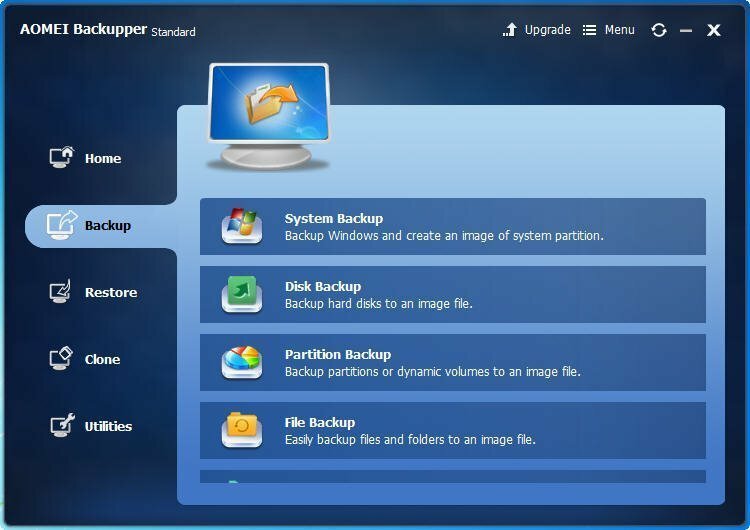 AOMEI Backupper Standard is such a kind of free system image backup software. it is very powerful, and you can use it to create system image by opening the Backup and following the wizard to make it. You’d better create system image backup to external hard drive. AOMEI Backupper provides you restore system image to your computer when you need to do, no matter your computer can boot normally or boot fails. If your computer still can boot, launch the progress and use its Restore utility to do it. If the computer boot fails, you can use the AOMEI Backupper to create a bootable media free, and boot your computer from it. It will show you the main interface of AOMEI Backupper, and you can click Restore and follow the prompts to restore system image. AOMEI Backupper should be the best system image software, because it can not only create system image, but restore Windows from it. You can even restore system image to a new hard drive with this freeware. Plus, AOMEI Backupper Standard is free for all Windows PC users including Windows XP/Vista/7/8/8.1/10. Besides, it has many other utilities to keep your data safe. Download it and have a try.